In our house Friday nights are family pizza night and I have a major sweet tooth so we can’t have pizza without something sweet to go with it. 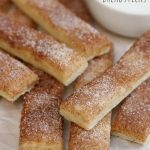 These Easy Cinnamon Breadsticks are the perfect treat to eat with pizza. In small cup, mix cinnamon and sugar. Unroll pizza crust onto baking sheet. Brush melted butter over pizza crust. Sprinkle cinnamon and sugar over entire pizza crust. Cut dough into small sections before baking. Make dipping sauce by mixing powdered sugar and half & half in small bowl.